A discussion between Ken Plummer and Jeffrey Weeks and other contributors chaired by Gregg Blachford and an update with Róisín Ryan-Flood. The Essex Sociology Department was prominent in the study of lesbian, gay and ‘queer’ lives in the mid 1970s; and this work continues to flourish today in the Centre for Intimate and Sexual Citizenship (CISC). This seminar will consider The Making of the Modern Homosexual and its ultimate bridge to CISC. 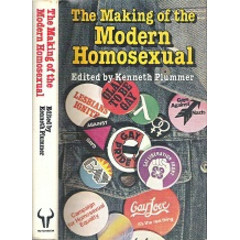 The book was published in 1981 and brought together a number of students and staff then studying in this field: the seminar will reunite some of those contributors to discuss how the book evolved, how it came to pose new questions and theories for the study of ‘homosexuality’, and how these ideas ultimately developed. The seminar will be held in memory of Mary McIntosh, who was a prominent member of the department between 1975 and 1996 and the first woman chair (1986-9), who died in 2013. The seminar will be followed by a reception to which all are invited. Delegates from outside the university are welcome to attend. Further details can be provided if they contact Ken Plummer in advance. (plumkessex@gmail.com). Posted by kenplummer on February 12, 2015 in Imagining Better Worlds, Politics and change, Sociological Imaginations and tagged activism, citizenship, Critical Sexualities, Essex Sociology 50th, gay -lesbian-queer, homosexual, intimate citizenship, Jeffrey Weeks, labelling theory, political change, Róisín Ryan-Flood, rights, sociology, symbolic interactionist theory.